Frozen custard and ultra-smooth ice cream at this Chantilly shop. 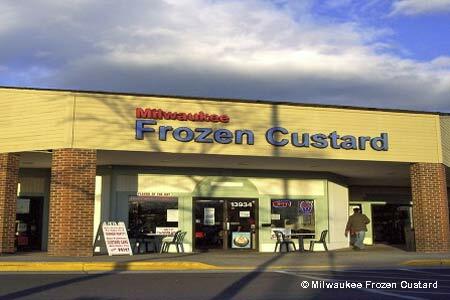 : Frozen custard, a concentration of egg yolk, creams and butterfat, is king in Milwaukee. At this bright, white Chantilly shop, the ultra-smooth ice cream is always available in chocolate and vanilla flavors. In addition, according to a calendar schedule, a third option such as marionberry or chocolate malt ball may be on tap for the day (the latter tastes just like those movie favorites). Also on offer are sundaes and shakes along with baked goods (think brownies and pies).